As we mature our bone density decreases and for many people it leads to osteoporosis. Women especially run a high risk with onset of menopause; estrogen prevents bones from breaking down, therefore bone loss in women dramatically increases because their ovaries stop producing estrogen after menopause. As a result, bone density complications and osteoporosis become serious health issues for women! Drugs that are used to treat osteoporosis and prevent the loss of bone mass are known as bisphosphonates. 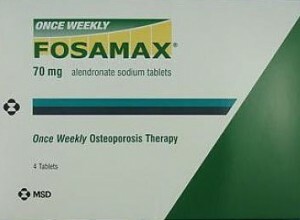 Fosamax , the most common bisphosphonate, was approved in October 1995 by the FDA. Over 20 million people have taken Fosamax, and countless others have taken a variation of the drug in hopes of reversing the natural bone loss process.In fact, numerous women begin taking Fosamax before menopause in attempt to gain a competitive advantage. Unfortunately, medical warnings report that Fosamax may be destroying bones rather than improving their strength. This is disheartening for the millions of women who have taken Fosamax anticipating for it to work like the self-touted miracle drug. According to a new study conducted by the Journal of the American Medical Association (JAMA), the long-term use (5 years +) of bisphosphonates can lead to spontaneous femur fractures and severe leg pain. Femur fractures are extremely rare, but what makes these scenarios even more peculiar is that the injuries were sustained from doing low-impact activity, such as walking. In addition, Fosamax has been linked to osteonecrosis of the jaw (ONJ), also known as “dead jaw.” Symptoms for ONJ include severe jaw pain, loose teeth, exposed bone, and the need for surgery to remove dead jawbone. If you, or a loved one, are taking Fosamax you need to be aware of the serious risks involved. The manufacturer of Fosamax, Merck & Co., is facing numerous thigh fracture lawsuits for ineffectively warning consumers about the dangers involved with taking their medication, such as atypical femur fractures and osteonecrosis of the jaw. If you took Fosamax and suffered adverse side effects, call the lawyers of Parilman and Associates at 1-800-391-8000 immediately. This entry was posted in Blog and tagged femur fractures, Fosamax, Fosamax anticipating. Bookmark the permalink.